Wednesday June 26th 1878 We worked at the house-cleaning and I finished the ironing this forenoon. Mother and Rob went to the valley in the afternoon and did not get home till night. The Robinson girls with Nora [Sal?] and Winnie were here to spend the afternoon. They all went out to the Fletchers after supper. I did up the work. Went to bed early. 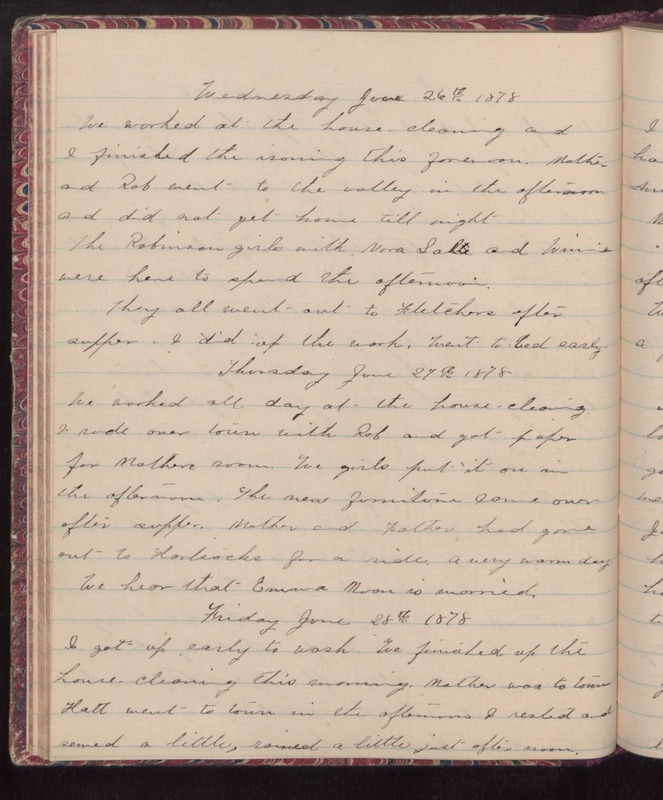 Thursday June 27th 1878 We worked all day at the house-cleaning. I rode over town with Rob and got paper for Mothers room. We girls pur it on in the afternoon. The new furniture came over after supper. Mother and Father had gone out to [Horlsocks?] for a ride. A very warm day. We hear that Emma Moon is married.Friday June 28th 1878 I got up early to wash. We finished up the house-cleaning this morning. Mother was to town. Hatt went to town in the afternoon. I rested and sewed a little, rained a little just after noon.